There are two sections on this page, one for Johnny and one for Steve. 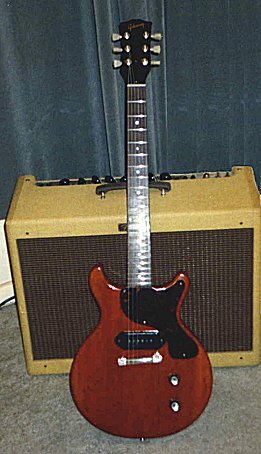 That "double guitar stand" below is a reissue 40 watt fender blues deluxe amp. It's mostly for home use but Johnny sometimes took it out for 'Treat' gigs. Johnny: "The guitar on the left-hand-side is my 1953 Les Paul which was actually a 53 converted to 59 spec." 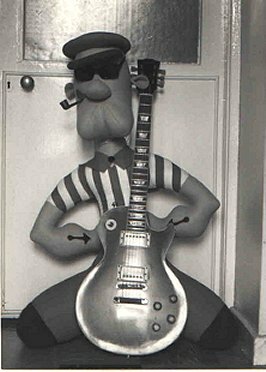 This was used mostly in London with when Johnny played with Steve in 'The PsychoPats'. "The other guitar is my 1959 Les Paul Junior, but hung on the wall is my only Silvertone slide guitar. I picked up the Silvertone in 1978 when Horslips were touring through Texas. I'd need to check with the lads which town we stopped in. I think it was Jimmy, Charles and myself who went for a walk around and hit a sort of bric-a-brac store where there was a rack of used guitars." On the right is a rare photo of Johnny playing with the Silvertone. It was never used on stage. The Silvertones would be associated with legendary slide players like Rory and Ry Cooder. 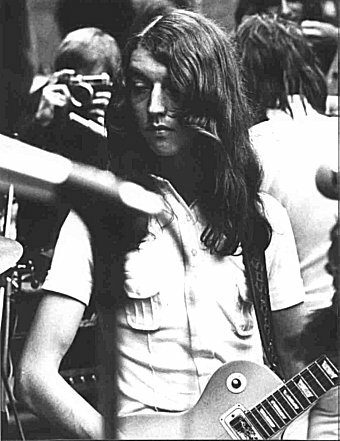 Led Zeppelin's Jimmy Page was fond of the Silvertone's lipstick tube pickup. "...anyway those Silvertones would have normally have come in a case which would've had a built in amp. But in the Texan town there was no case and I parted with just $10 for the guitar." Bob De Jessa took this photograph. There's that 40 watt guitar stand again! 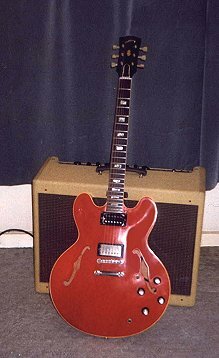 "I used this 1963 Gibson Cherry 335 in London with 'The PsychoPats' until it eventually got passed along to Gary Moore. Gary used it on his 2001 studio album 'Back To The Blues' ." "In this photo (left) you can see that I'd removed the scratch-plate which I sometimes do when cleaning the instruments. Although Gary now has the 63, I still have an identical 1962 Gibson Cherry 335." 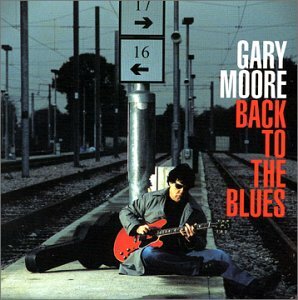 You can see the guitar on the cover photo of the Gary Moore album "Back To The Blues" which is shown on the right here. "That's my 1959 Gibson Les Paul Junior on the right." "I first set eyes on this 'killer' when it was brought along to a gig in O'Neill's at Finchley North London in 1999. Basically I bought the instrument on the spot and it became my main guitar taking over from the Gibson Cherry 335. " You can compare Johnny's two '59 Les Paul Juniors below. On the left is the '59 original (again) and on the right is the spare Junior. 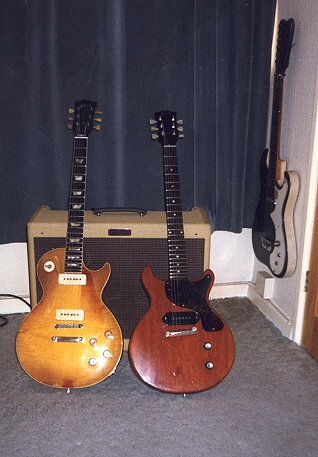 "Below is my spare '59 Junior which is fairly well identical in looks and spec to the '59 Junior shown left. This (the spare) has a slimmer neck and produces slightly brighter top end tones. 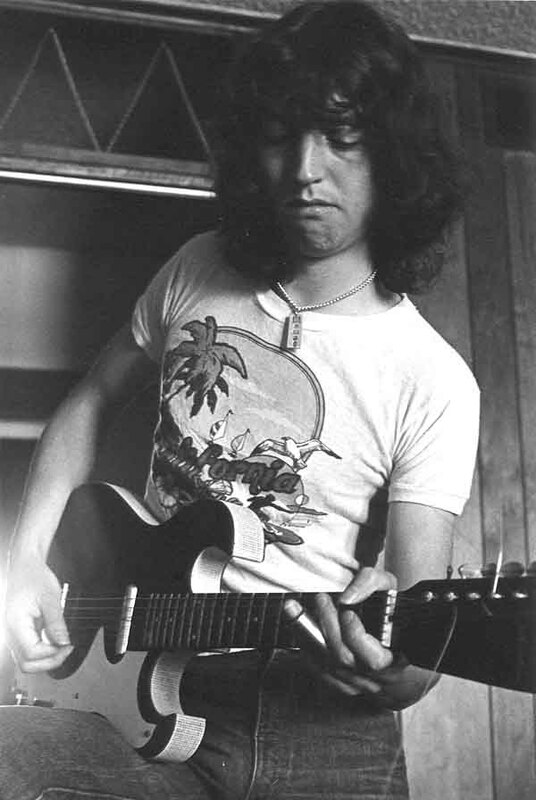 "This, my 1960 Gibson Sunburst, was first used on the 'Aliens' album and I used it all the way through 'The Man Who Built America', ' Short Stories, Tall Tales' and 'The Belfast Gigs'. I kept it through 'The Zen Alligators' and 'Host' when I also introduced a black Fender Stratocaster." Speaking of the 'Aliens' album it's probably worth saying that Johnny had the vocal style of (Cream's) Jack Bruce very much in mind when laying recording for 'Ghosts'. "Actually 'Ghosts' is my wife, Maggie's, favorite Horslips song. 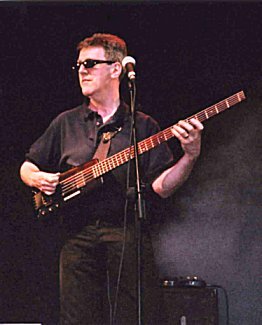 Jack Bruce would have been one of the stronger influences on my singing style especially for the falsetto I used on 'Ghosts'." .....and the guitar stand? A limited edition Popeye Sunburst with two good ears? Although this photo makes the body of the guitar look dark, as the focus is upon the headstock and upper fingerboard, it is the actual instrument featured on the front cover of Tony Bacon and Paul Day's book "The Gibson Les Paul Book"
Below right, the '57 goldtop again. 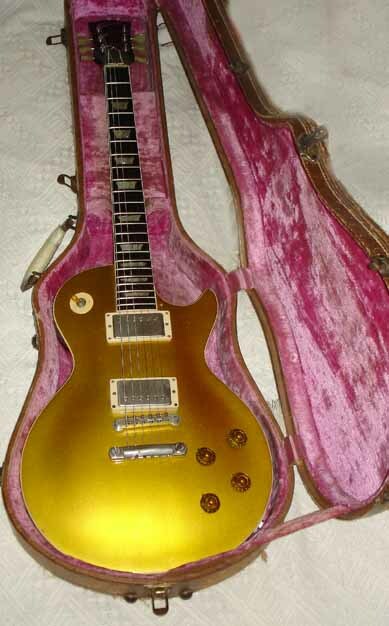 Compare it, particularly the pickups and bridge, with the '53 goldtop on the left. Each guitar is shown in it's own original brown/pink lined Lifton case. This was late '53 with steeper neck pitch. It's 100% original. For those who really take notice it has Serial #3-2241 with a weight of 8lbs & 3 ounces . Again this is the guitar actual from the Bacon and Day book, but this time the pick guard is removed and the photograph color is truer. 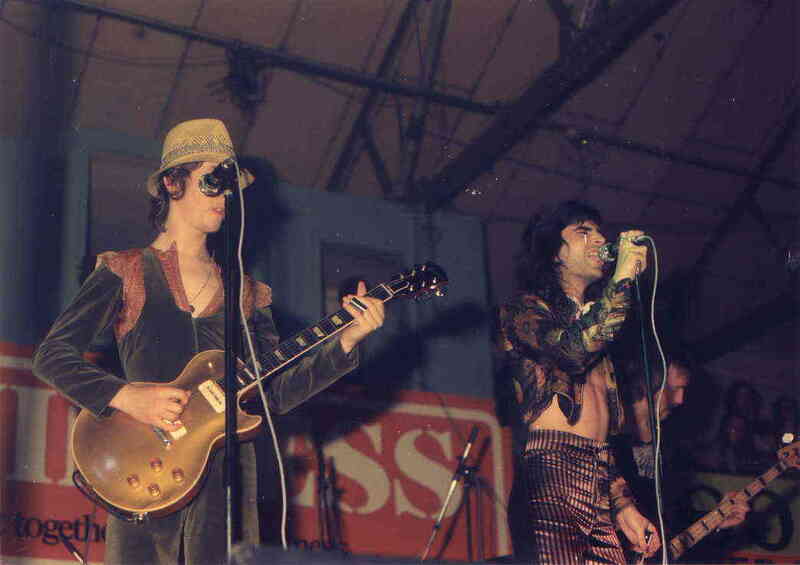 Just now, we've not turned up a guitar photo of Johnny's 1970 Gibson Les Paul Goldtop but here's a photo of Johnny with it at the 1973 Phoenix Park peace concert. "This was my original Horslips guitar used on 'Happy to Meet' and 'The Táin', and the guitar on which I found the 'Dearg Doom' riff. We all dressed in white for that concert - that's Jimmy Lockhart behind me there." A photogenic Lockhart and the 'Lips lads all in the white! The original "boyband" or what? They say that, after a while, a man and his pet start to look the same. Does the same adage hold for man and guitar? Here's a photo of a gold topped Johnny( & Charles & Barry) with his 1952 Les Paul Gold Top. The photo was taken by Jim McDonald at the stadium, Dublin. 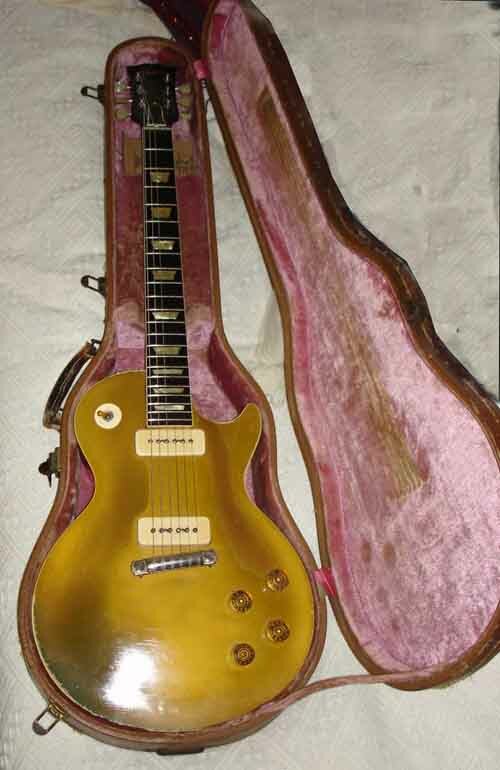 Johnny used the Les Paul Gold Top from 'Dancehall Sweethearts' time all the way through until 'The Book of Invasions'. You'll see it too, on the fold-in part of the sleeve for the double 'Horslips Live' album. 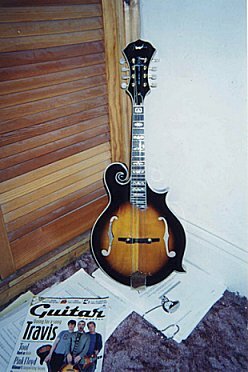 This Fender 'f' scroll mandolin is based on the (expensive) Gibson 'f' scroll mandolin. "It's currently my only Fender instrument. I have it really just to play for pleasure." 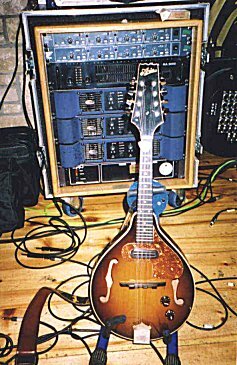 "This is my Aria electric mandolin, as currently used on gigs"
Photo right from Walsh's Hotel Maghera, 2003. 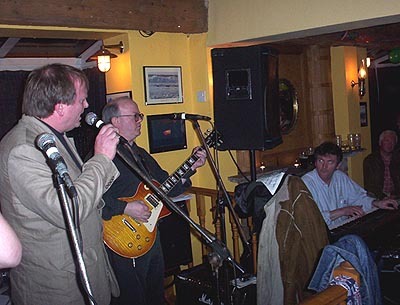 Below from De Barra's, Cork 2005. 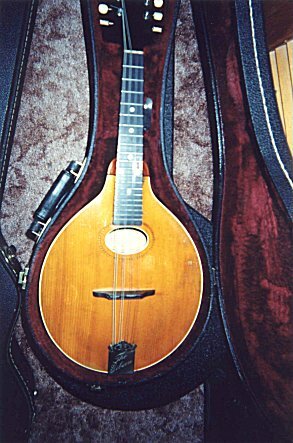 Gibson 1914 "A" Style Mandolin. Johnny: "I bought this little instrument in late 2001 in London, just as I was packing up to return to Ireland. It's not yet been used in studio or stage, but if an opportunity arises I might wheel it out." Photographed in and out of case below. 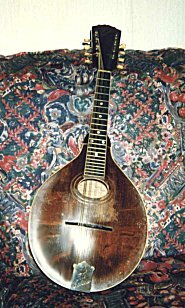 1916 Gibson A2 String Mandolin. "I first laid hands on this one just before the recording of 'The Táin'. But it wasn't used in the studio until September 1975 for the recording of the Horslips Acoustic Christmas album 'Drive The Cold Winter Away'. 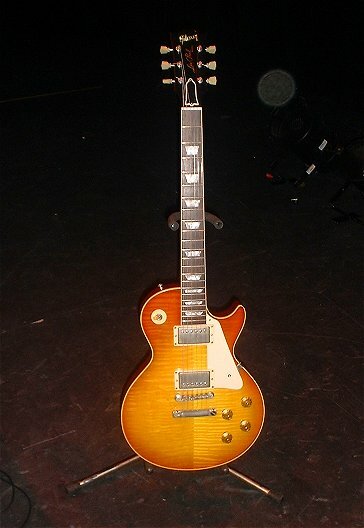 "This photo from 2003 was of my 1997 Gibson Sunburst, a Historic Les Paul Standard 1959 Reissue previously owned by Mick Ralphs from Bad Company." 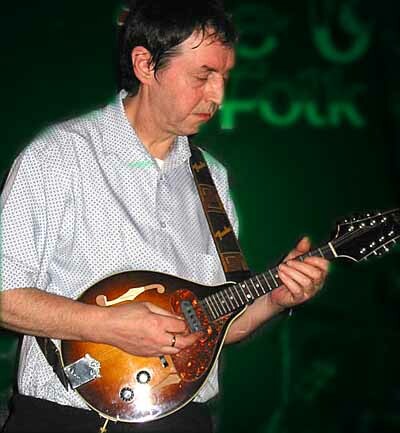 Johnny has since passed this guitar onto Paddy Goodwin. 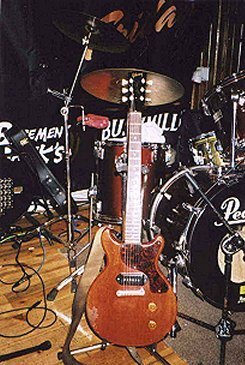 Below, March 2005 and Paddy uses this same guitar at the 50th Party for Pat McCabe (Author of Dead School, The Butcher Boy, etc.) Barry Devlin and Jim Lockhart join Paddy for 'Furniture' and 'Sword of Light'. 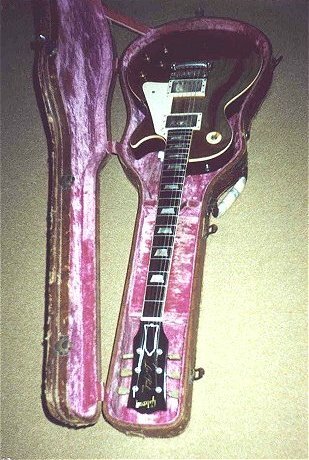 When gigging Johnny used the Sunburst as a spare for the 1959 Les Paul Junior. 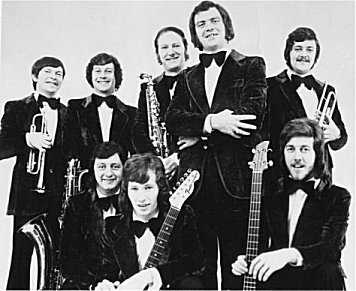 Below: Steve Travers aged 22 kneeling front right with his Dan Armstrong Plexiglass Bass with The Mick Delahunty Jnr. Orchestra. 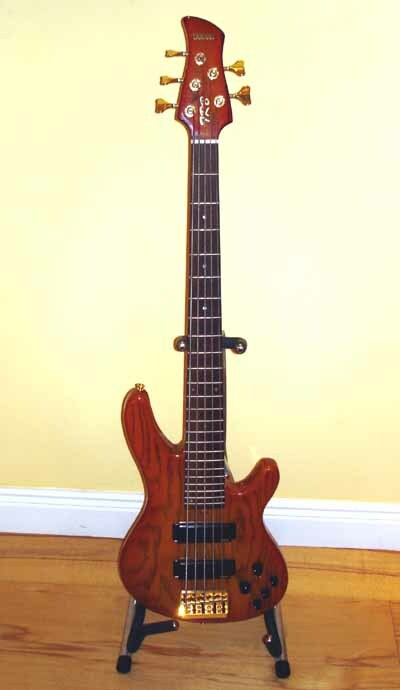 Right: A replica of Steve's Dan Armstrong Plexiglass Bass Guitar. Barry Devlin and Brush Shiels each had one. Steve's original was destroyed during the Miami incident in 1975. The fate of such an item of music and beauty surely carries a poignant message about the futility of the event which caused its distruction. 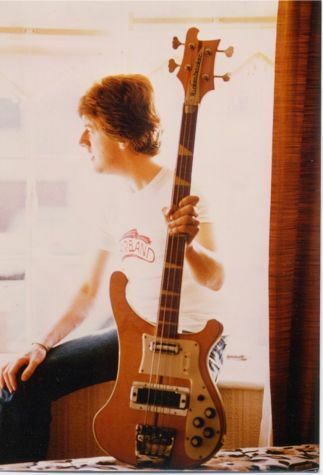 Steve: "Here is the picture of my Rickenbacker Stereo bass in 1976. It had gold Grover machine heads and chequered binding and was probably one of the finest examples ever made." "I had many many offers for this including one from the bass player from Pilot ('January', 'Magic', etc.) who offered me his Rickenbacker plus a substantial sum which I refused." 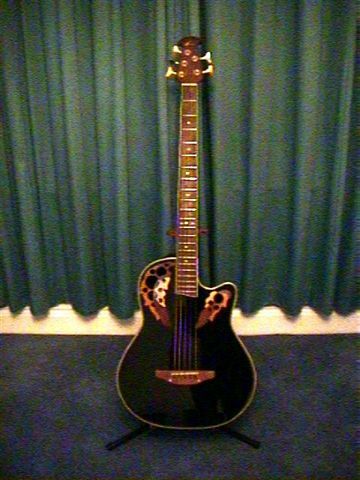 Here's Steve's "Ovation Celebrity" five-string bass guitar. Steve: "Because of the rounded back, it's not very practical to play in concert - it moves around a bit! But it has quite a unique sound both acoustically, and amplified. 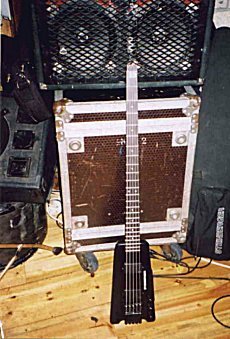 I bought it new at 'The Bass Centre' in London some years ago and they crafted a customized setup which included shaving the bridge to get a lower action." Steve is considering whether to task guitar-specialist Chris Larkin with lowering that bridge even more! You won't see too much of this beauty, as Steve generally uses it at home, for writing and in the studio. 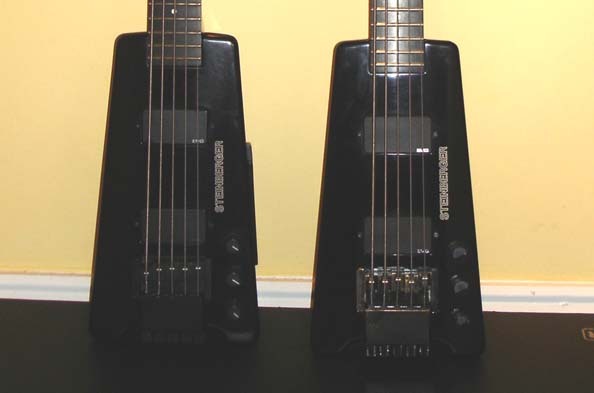 The first of Steve's two headless 5 string Steinberger Bass Guitars. 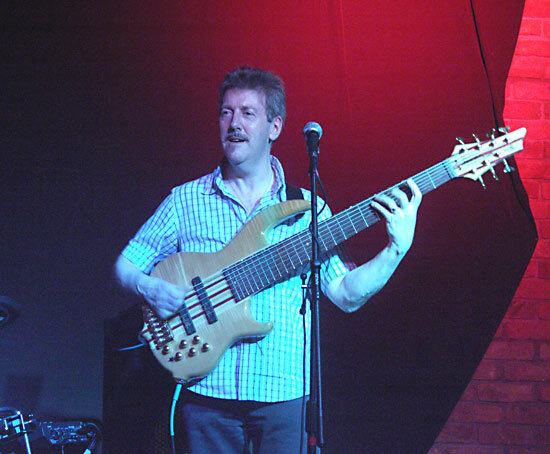 Steve: "I bought this one in London, 1984 it was set-up as a 4 string Bass. A new Nut and Tail Piece converted it to the 5 string set-up." 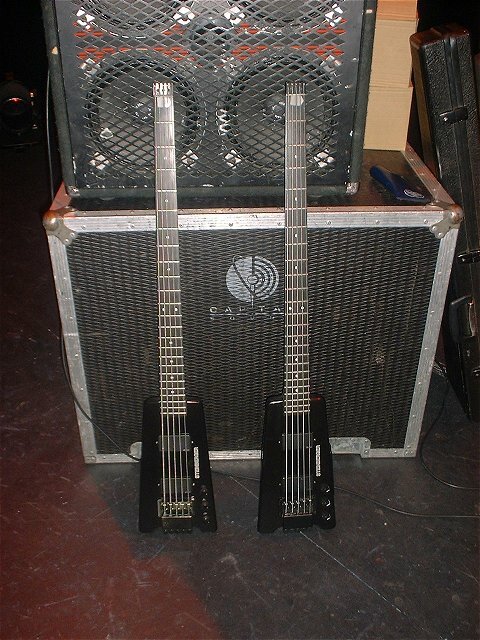 Steve bought his second Steinberger in 1999 during the time he played with Johnny in the 'PsychoPats'. That's one of Steve's Steins on the site Fean & Travers site banner. Above, Steve with his original Steinberger, June 2002. Steve: "The second instrument was already at the 5 string spec. The guitars are identical and are each constructed from single carbon graphic piece." Above:- a rare opportunity is taken to show both Steinberger Twins relaxing after the gig at the Millennium Forum in Derry. 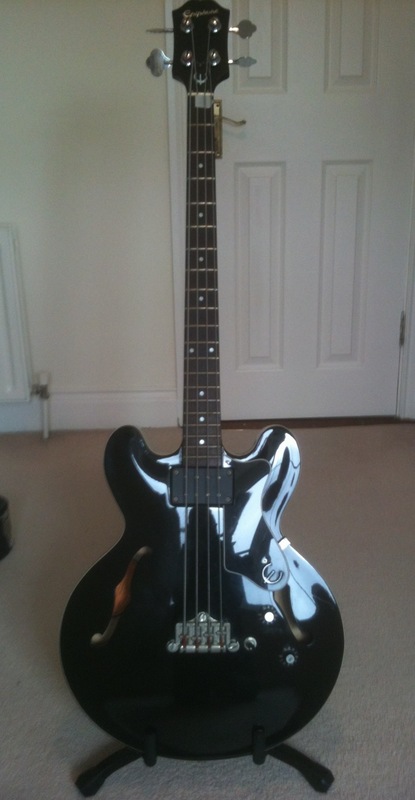 Here's a photo of Steve's Amberburst Yahama TRB Bass, bought at the Wembly Guitar Centre Summer 2003. Steve: "It's made from light ash and has a particularly warm feel which suits our Blues work." The TRB travels with Steve so you'll see this 5 string Yahama being gigged around the country on and off. Make sure to check out the anthology on the photographs page for a few more photos of Steve along the years. Look out for his Fender Precision in the Salthill photograph. 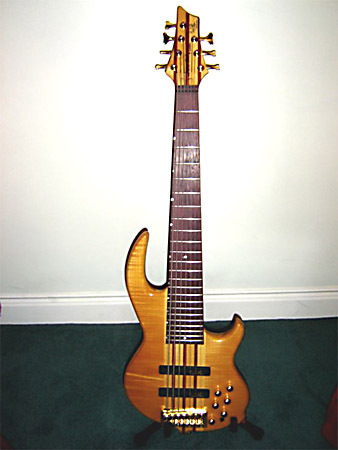 This one is a Seven-String bass guitar!! Groovetools GTBD-7 Natural Curly Maple Top Swamp Ash Body Wings, 7 Piece Maple/Purpleheart Neck-Through, Purpleheart Fingerboard, Bartolini "Bill Dickens" Model Pickups, Custom Bartolini Parametric Frequency Selector, Brilliance Control, Volume, Blend & 3-EQ, Gold Hardware. Below Steve plays it in Mc Hughs, Drogheda July 2007. Notice how wide the fretboard is! 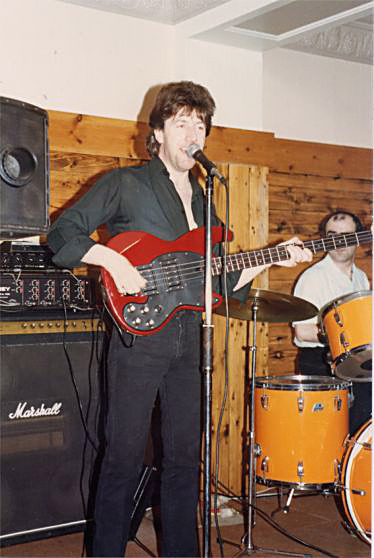 Steve " Here's a picture of me in London during the early to mid eighties playing my Wal Pro 2 E. That was the bass I used on the four tracks I played on Barry Devlin's "Breaking Star Codes". "Love With a Sting its Tail", "Aquarian Girls", "Let The Scales Decide" and for the life of me I can never remember the name of the other track I did for him. The Band for that photo was called 'The Great Hunger'. More details about The Great Hunger on Steve's section of the about the band page. Steve "This is my Epiphone Rivoli Bass. These basses were used by many of the great players during the 60s. Epiphone and Gibson electro-acoustic guitars were the choice of bands such as The Beatles and their semi-solid basses had a wonderful, thick, muddy sound that are immediately recognisable on recordings by bands like The Animals, Spencer Davis and Jefferson Airplane. Since I was a teenager, I wanted an Epiphone Rivoli which was virtually identical to the Gibson EB-2 and when I discovered that they were reissued briefly in the 90s, I couldn't wait to get my hands on one. I eventually found this beauty for sale in Tralee in late 2011. I changed the stock pickup to a DiMarzio Model One. It looks absolutely fabulous and plays like a dream. The minute I picked it up, I just had to play Chas Chandler's "We Gotta Get Out of This Place" and quickly followed by Muff Winwood's "Keep On Running". I was a kid again. I used it on the Lovin' Spoonful track "Coconut Grove" when we did the Lyric FM sessions." Here's a link to a video at the same session but with Steve on one of the Steinbergers. Here's another Dan Armstrong Plexiglass bass. This time it is a smoked Plexiglass body. Steve "It was very rare and I had it for a short time in 1976. The equipment behind me in the shot is interesting gear. The bass amp is my Ampeg SVT. 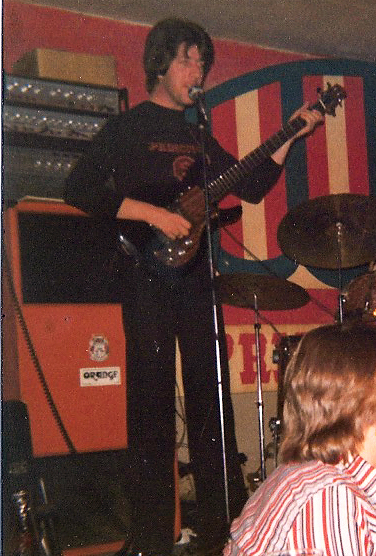 The Orange “scooped” bass cab had two Gauss 15 inch speakers; one looking up and the other looking down. The two units on top of the Ampeg look like a HH PA amp and a HH Echo unit. Those were happy-uncomplicated days! " Thanks to Chris & Pete Somers for several contributions for this page.